We are now going to look at two very important laws involving three sets $A$, $B$, and $C$. Theorem 1 (De Morgan's Law 1): If $A$, $B$, and $C$ are sets, then $A \setminus (B \cup C) = (A \setminus B) \cap (A \setminus C)$. 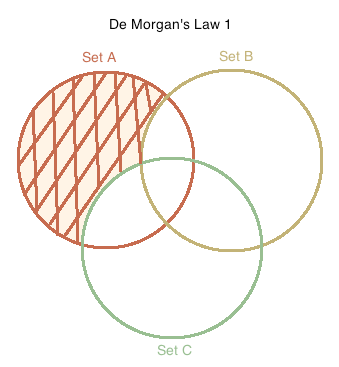 The diagram below illustrates De Morgan's first law. Proof: $\Rightarrow$ Let $x \in A \setminus (B \cup C)$. We know that $x \not \in B$ and $x \not \in C$. Therefore, $x \in (A \setminus B)$ and $x \in (A \setminus C)$ so $x \in (A \setminus B) \cap (A \setminus C)$. Theorem 2 (De Morgan's Law, 2): If $A$, $B$, and $C$ are sets, then $A \setminus (B \cap C) = (A \setminus B) \cup (A \setminus C)$. 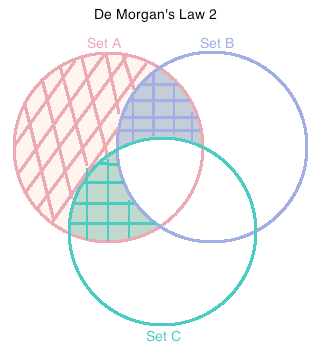 The diagram below illustrates De Morgan's second law. Proof of Law 2: $\Rightarrow$ Let $x \in A \setminus (B \cap C)$. So $x \in A$ and $x \not \in (B \cap C)$. So $x \in (A \setminus B)$ or $x \in (A \setminus C)$ so $x \in (A \setminus B) \cup (A \setminus C)$.